Your business strategy will be built on a deep understanding of customer and user needs. Knowing needs creates a foundation for everything else. Everything in your business strategy can be tied back to addressing customer needs. 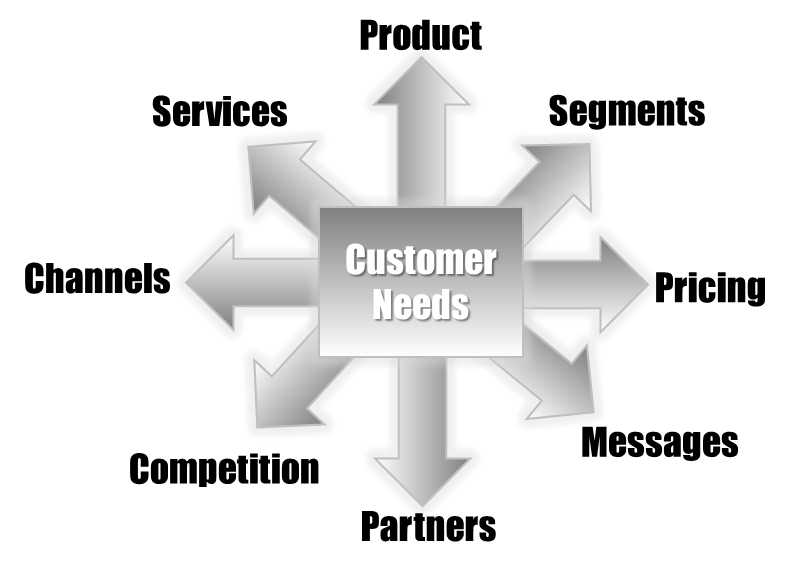 Understand your customers’ needs and you can build a great business. Addressing needs drives the products you build. Needs are how you frame and organize market segments. How the resolution of needs is valued is the basis for your pricing. Your messaging is all about communicating how you uniquely solve customer needs. The partnerships you choose to complete your whole product are driven by customer needs for a complete solution. Your competitive strategy is all about how you create sustainable differentiation from competitors in the way you address customer needs. Your sales and service model also tie directly into your understanding of customer needs. The landscape changes constantly because needs are never static. They change over time as your customers change, as the market changes, and as your product changes how customers think about their problems and aspirations. Throughout this site, I’m going to keep returning to this basic concept: Know you customers’ needs and you can build a successful strategy for your business.